What happens when things don't go the way you plan? Can you try and try again? Spirit is a beautiful picture book about hope. Cherri Ryan is an author who is inspired by the children and families she cared for as a family doctor in Australia for almost twenty years. When she is not writing, Cherri works in medical education, and enjoys helping organisations that help others. In 2016, one of Cherri's stories was animated and projected onto Brisbane City Hall as the Christmas Lights Spectacular. She lives in Queensland, Australia, with her family, one cat, two guinea pigs and many visiting birds and possums. Cherri believes in hope, joy, perseverance and the power of stories. 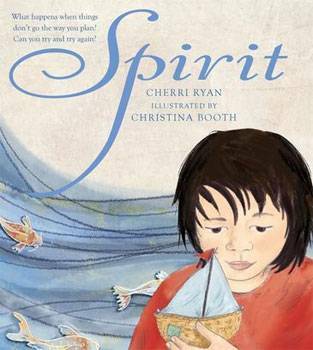 Her first picture book, Spirit, follows a young girl with creativity, courage and sailing dreams. Award-winning author–illustrator Christina Booth works from her bush studio surrounded by amazing native animals, colourful birds, her chickens, a failed elderly guide dog and studio cat. She considered being an Olympic athlete, a hairdresser or an archaeologist when she grew up, but she didn't. She wasn't as good at them as she was at drawing and writing stories. Christina was awarded a CBCA Honour Book Award for her book, Kip, and has won numerous awards including the Environment Award for Children's Literature for her story, Welcome Home. Spirit (written by Cherri Ryan) is her first picture book with Black Dog Books.